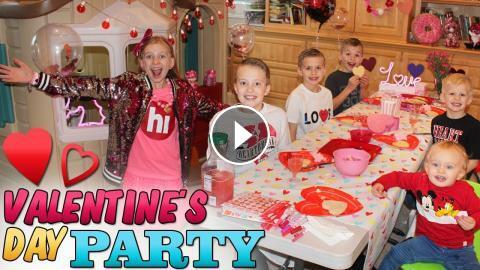 It's time for the kids' annual Valentine's Day party! Alyssa has decorated the playhouse and playroom just in time for all the guests to arrive to the party. She has even better decorations than before because she has been saving them up over the years--plus pink is her favorite color! All the guests arrive with something for the party: DIY cards to decorate, flowers, balloons, and prizes for the games. The games are funnier than ever this year! Even Owen joins in on the fun (and he's SO cute!) Hope you enjoy the skit and seeing the adorable valentines the kids made. New videos posted daily! Challenges, Epic Road Trips, Vlogs, Toys, Clothes, Food, and lots of other fun things! Family Fun Pack is a family of 6 kids: Alyssa, David, Zac & Chris, all born within 39 months of each other, Michael and sweet baby Owen! Our motto is "fun with the family, every day"! We spend as much time together as a family as we can. We love to travel and see the world. When we are home, we like to play with Play Doh, Costumes, Hot Wheels, Surprise Eggs, and of course the fun things like electric ride-on toys. We enjoy celebrating holidays like Valentine's Day, Easter, Halloween & Christmas, we have fun birthday parties, we love indoor playgrounds and outdoor playgrounds, bounce houses, parks, water parks, Disneyland, Legoland, Legos, water toys, Thomas trains, play houses, forts, trying new foods, going to the beach, swimming, pools, Barbies, languages, sports, soccer, makeup, Alyssa loves Justice, horses, animals, and pretty much everything sparkly and pink! Her motto is Everything's Better with a Little Glitter! Be sure to watch our popular videos, such as 24 hours with 5 kids (now, 24 Hours with 6 Kids), kid size cooking, & our Costume Runway Show -- we have many of each of these :) Also be sure to tune in on Mondays for Mommy Monday, our weekly vlog.